In a match litered with injury and momentum swings, Dimi takes on Novak Djokovic for the third time and does what he could not do in Indian Wells. Dimitrov takes out the No#1 player in the world and surely now has a place in the locker room as the new up in coming threat to the the top 10! The world number 28 had not won a set against Djokovic in two previous meetings but was in inspired form to win 7-6 (8-6) 6-7 (8-10) 6-3. 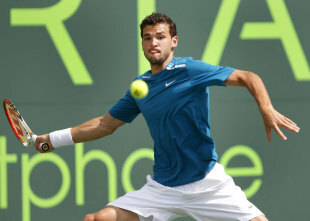 Djokovic won a second-set tie-break but Dimitrov showed incredible courage in the face of intense cramping to secure the biggest win of his career. To be fair, Djokovic injured his ankle midway in the second round. It is to be seen what will happen with that injury although he was playing very strong even with the injury. It looked like a repeat of Dimitrov vs. Nadal with the cramping coming back and questioning Grigors fitness regime but he was album to push his young body to the brink and pull this one out of the miracle hat today! Bet he is going to celebrate with some Sugarpova tonight! !